4 Sizes Available. Xtra Large is for 225 lbs. + Individuals. Large Deluxe can be used by 200 lbs + also if the chair or car seat is small or individuals below 200 lbs., who need extra cushioning. Please make sure you have enough headroom to accommodate the 2.5-inch thickness. You can always order the Large or Regular size with 2-inch thickness Uses: Concerts, Wheelchairs, Sports, patio, church - Can be used in office or car if extra thickness needed. Comes with a handle. Also available is our ERGO21 Extreme Comfort Original Cushion, Contoured Slope/Wedge Design. Uses: Office, car, home, long flights, trucks and any seating surface. ERGO21 Cushion is also effective even on expensive chairs and car seats, recliners, sofas etc. Works great on wooden chairs, kitchen chairs, and long seminars. 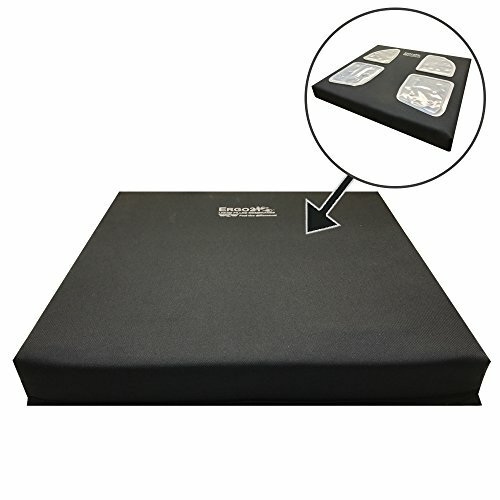 Reduce the discomfort and muscle fatigue you feel from sitting for long periods of time with our ERGO21 Seat Cushion. Its advanced LiquiCell technology provides relief from pressure and aids circulation through constant liquid floatation. By equalizing the pressure put on your tailbone and legs while sitting, ERGO21 Seat Cushion eliminates muscle fatigue and soreness. Anatomy of a Perfect Seat Cushion: A seat cushion should not restrict your movements or cut off circulation. By carefully combining the proper density of polyurethane foam and a layer of LiquiCell Membranes to maintain blood flow under the tail bone - hot spots and vertical pressure on the sitting bones is virtually none. In addition, we use the highest quality fabric that's durable, long lasting and cooling. Recommended as an aid for unresolved lower back pain, history of fall or accident, difficulty sitting for long periods of time, difficulty riding in the car, buttock pain, hip pain, groin pain, leg pain, sciatica and other issues involving sitting. Watch our video and read case studies about LiquiCell Technology on ERGO21 website. Regular is for less than 150 lbs. + or smaller chairs. Large is for 175 Lbs. + Large Deluxe is for 200lbs + and Extra Large for 225 lbs. + Tip: You may also want to measure your Chair or Car Seat. Regular and Large are 2 inches thick. Deluxe Large and XL are 2.5 inch. Make sure you have enough headroom and your chair can be lowered. For sensitive skin and sore issues we recommend our one inch thick soft Ergo21 Travel Cushion. Ultra-thin cells contain liquid that's in constant motion allowing your body to glide and float - non-skid gripping bottom with carry handle. Uses: Home, Office, Cars, Trucks, Recliners, Meditation, Wheelchair, Recreation, Concerts, and more. If you are tall and have less headroom in your car, then try our one inch Travel cushion. If you have any questions about this product by Ergo21, contact us by completing and submitting the form below. If you are looking for a specif part number, please include it with your message.